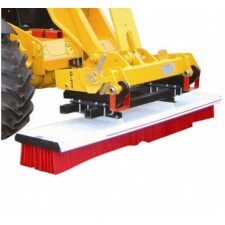 Our sweeper telehandler attachments are designed to convert your telehandler into an efficient sweeping machine. Our range of telehandler sweepers and brushes offer an effective way of using your telehandler for simple yet effective sweeping and cleaning up duties. Available in different broom widths – from 1,525 to 2,440 mm – this attachment ensures an easy cleaning solution on large floor areas.